CMU810 + CMU800 - Computer Synth Module BACK TO Roland MENU / zurück zum Roland Menü..
ROLAND SH1 same but less VCOs (1+sub) but still enough to "model" a good bass! quite rare over here in germany. 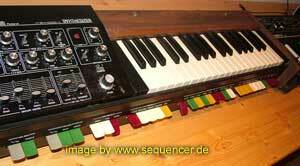 this was the first roland synthesizer!! 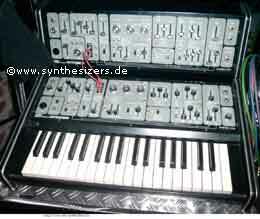 it's case is all plastic like the TR808, became rare here in europe..
like the sh3 the SH7 also has a number of sliders from 2' to 32' (rectangular waves only) to get a nice mix of VCO1 "all star" octaves ;) more on sh-7 below..
Roland SH-1 - close up..
with 2 VCOs plus Subosc, the VCO2 can (of course) be detuned, PWM on both OSCs or saw, 50:50 square, tri, saw, LFO with delay and ADSR env (only one with gate for VCA and LFO retrigger), VCF as said 24dB/oct for big basses this is a good synth, still..
roland SH-2 synthesizer - click to enlarge..
it is a very fat and big bass capable synth! 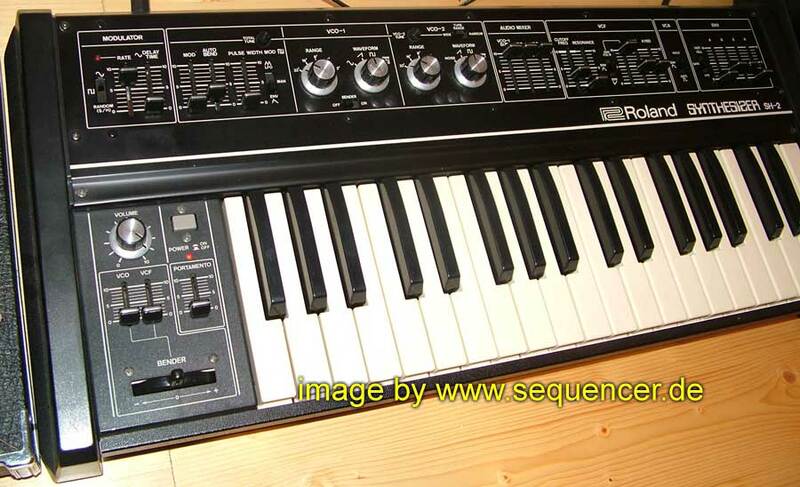 SH1 - click to enlarge..
above: Roland SH1 synthesizer 1978 - click to enlarge..
below: roland SH2 synthesizer - click to enlarge..
was a smaller version of the SH2, only one VCO and small size. nice on stage. 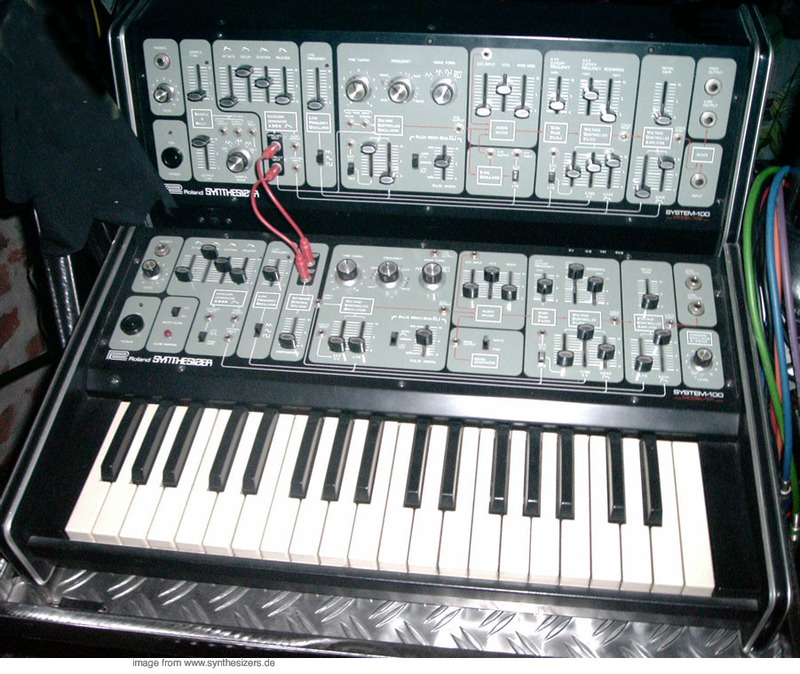 one VCO, ENV, subosc and PWM, one LFO, but still enough for basses and stuff, it's not really a monophonic juno 6 but sort of.. looks like the sh2 but one VCO lost .. see the pic on the right..
the sh3 had 2 preset-like slimmed down versions: the sh2000 and sh1000, technically they have all aboard but the controls are "missing" replace by some global parameters and some presets..
german/deutsch zum S/H: was macht dieser s/h nun hier? also: du hast ja 2 lfos, diese können mittels s/h als quellsignale verwendert werden.die s/h schaltung hat 3 wellenformen (sägen steigend und fallend und dreieck und random) diese kann in ihrer auslesegeschwindigkeit geregelt werden und auch das level kann eingestellt werden.so bekommst du natürlich bei kleinen schritten viele stufen (kleinere) und bei weniger steps (also mehr proben pro zeiteinheit) eben feine..
diese parameter sind bei aktuellen synthesizern oft garnicht mehr einstellbar,diese stufen sind also nix anderes als das,was ein arp'er machen würde, nur kann es auch "schräger" sein,weil es ja nicht quantisiert ist !! 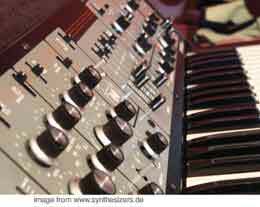 so isses.. die letzten teile im sh3a audioschnipsel sind so entstanden..
the (1974) SH3a is a real underestimated analogue monster that allows to mix in any OSC ": find a slider for 4",8" etc. and an additional chorus for 8", so it is a "subosc in a special way", env, nice routing,lfo,s/h.. quite sh5-style-student synth ;) imo underestimated fatness! there has been a model SH3 but it's only optical and very little technical changes that makes the difference b.tween sh3 an sh3a. 12dB/oct. filter (LPF). 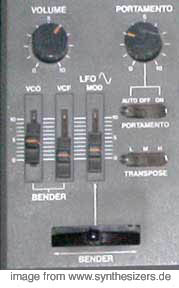 and 2 LFOs. 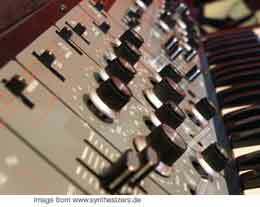 btw: Review (deutsch) zum SH-101, MC202 und CMU810 hier!!! 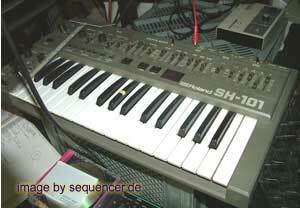 the sh101 has a little 256-step sequencer and it's LFO can trigger the env, 1 VCO but has SubOSC 1 or 2 Octaves below the main VCO. 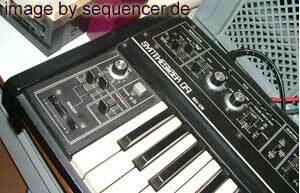 fat sounding..
SH101 panel .. see the arpeggiator & sequencer? btw: Review zum Sh101 hier!!! Envelopes and Filters played by the internal transposable sequencer (not shown here) mp3 listen! 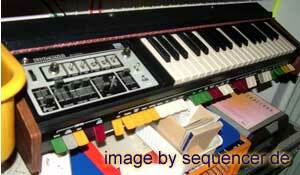 LFO Random, then Noise mp3 listen! 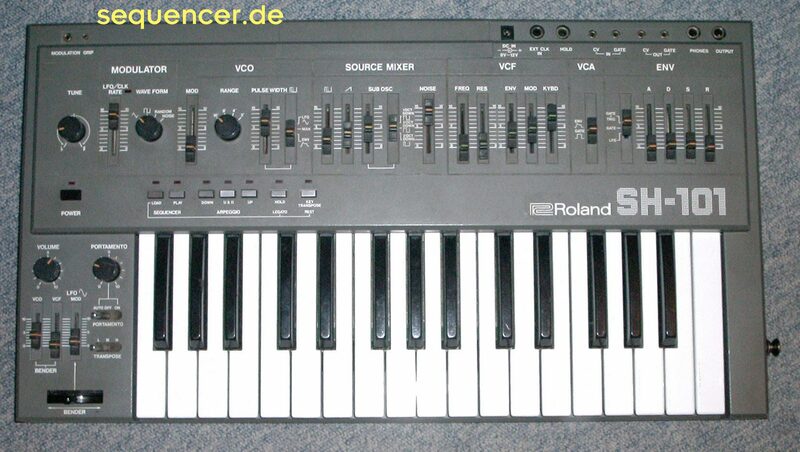 Rolands head, mr kakehashi was always quite innovative, so roland made a compusynth that featured the sound engine of the SH101 .. or to be exact: the mc202: the CMU810 has sliders but no keyboard in a white case to be controlled externally or by computer via CV.. it is quite exotic today..
1982 - the SH101 was born..
or less know computers: Sharp MZ80K, NEC PC 8001.
there are melody, bass and rhythm sections (8 sections in total) with at least an (gate) LED to show it's status, most had to be edited via the computer. note: midi was close to come but not yet ready, 1982 the CMU-800 was available through 1986. rare these days..
it has 8 CV and Gates outs, clock etc..
a 50 pin cable connects the CMU-800 to the computer host. 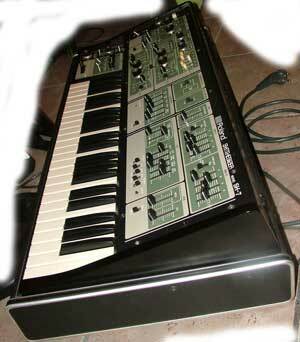 there are some synths in it quite like the sh101 and smaller.. for each section..
we design the future! Roland did..
on the pic (upper right) you can see the addition available sync box..
but of course has no "check points" or semi modular patching capabilities, but it has a great manual BPF.. it's not CV-controllable, but it sounds great.. the sys100 has 2 real ADSR whilst the Sh5 has only ADSR and AR (no AR unfortunately, so it needs to run ADSR for VCA and VCF for big basses)..
SEE BELOW for a TRICK TO SPEED UP THE LFO to AUDIO SPEED with NO MODIFICATION AT ALL!! 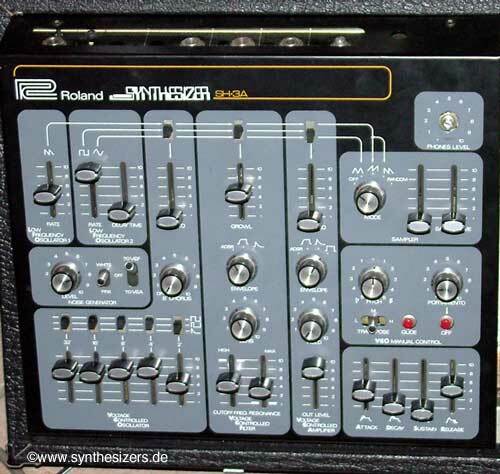 schematics of the Roland SH5 here..
a nice little SH5 song called "KliniK Room 5" (check my music site MoogulatoR .de under audio to listen to it..), roland sh-5 only directly to the mac, encoded in 128bps mp3 and no more than just playing it, no overdubs, etc.. just one take and thats it! 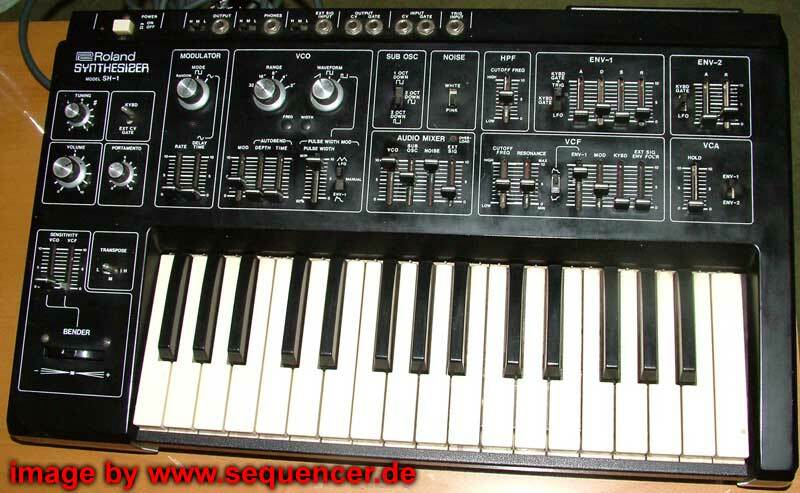 4)same with LFO2, it's made of Op-Amps! 5) the "preset env" may be exchanged by knobs? 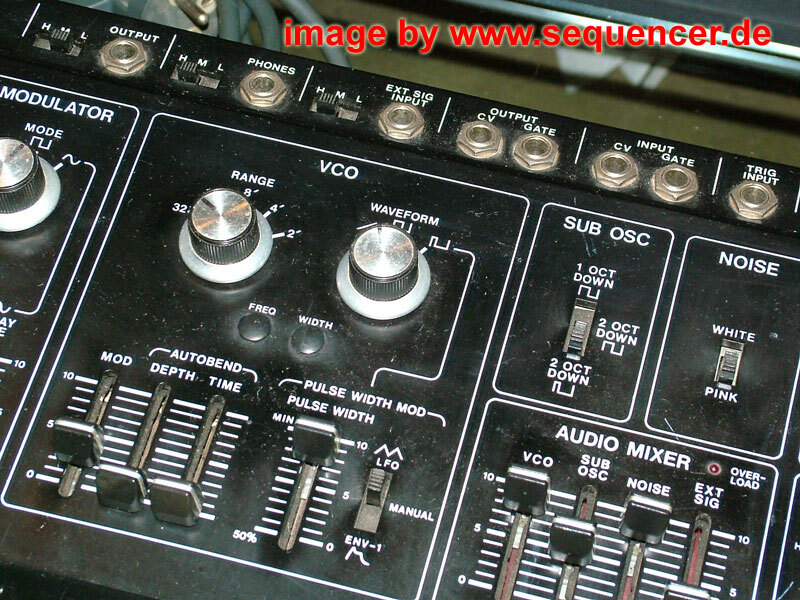 2) turn filter to ADSR and the amount knob (sens.) up! 4)set A,D and R tu a very small amount and experiment: this is your LFO shape!! 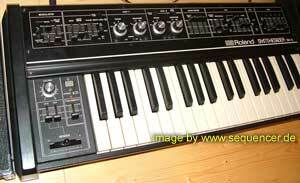 now you got a very fast filter FM like on the jupiter 4! 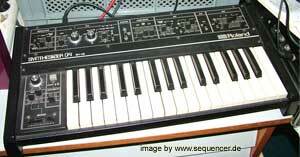 without any chance, the secret is the faster s/h speed that the sample and hold clock needs to produce to "sample" the LFO1s waveposition. (of course the lag does not mean something in this case: I just use the clock to trigger the ENVs! : works with AR,too..
please email me, if some1 ever did a mod to the sh5!! tell me!! and how you did?? 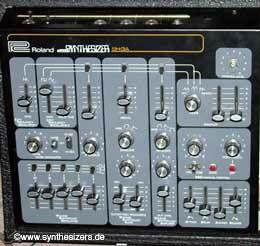 somewhat near that sound... the Roland System 100 (not 100m!) 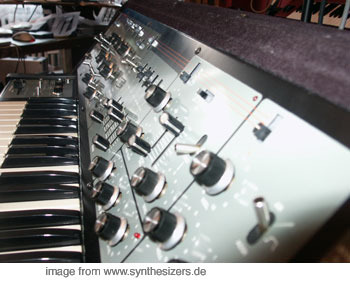 typischer Roland sound: das 100er System..
"born in 1975" - the SH-5 synthesizer. why the hell did they never made something like MC404 or SH404 or SH4? 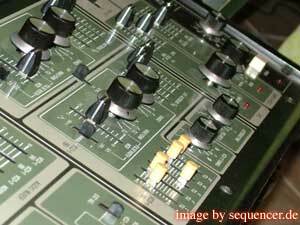 modifications LFO: The trick is to replace the original opamp with a FET type. 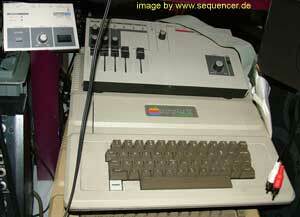 If I remember correctly, it was a 1458 and was replaced with a TL082. This allows a wider range of speeds available by replacing certain resistors and/or caps. I *did* document the changes, but have never scanned them in. I'm sure a decent tech can do the same. Here's the results from the unit I modded below (this URL). take a short patchcord and connect the out to the ext. in! now you have some control over the sh5, when you switch the ringmod to ext (via BPF), nice sounds! 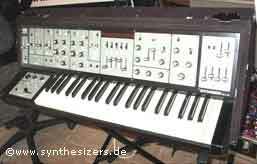 the sh line and system 100.. 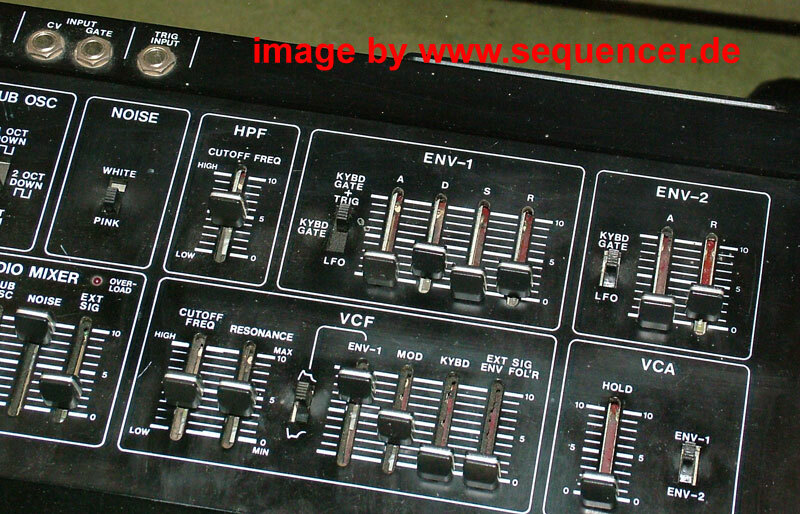 The SH7 is the flag ship of the SH Series, it is basically more like the sh5 than the others..
it has 2 complete ADSR envelopes, VCO or noise can mod the 24dB/oct. LPF filter. it has no BPF like the SH-5 but it's filter has 24 instead of 12dB/oct like the sh5 has. but it is not a multimode filter!.. 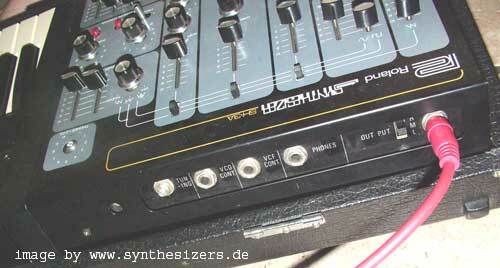 the sh7 has 2 VCOs with hard sync (soft sync got lost over thos 3 years between the 1975 made sh5 and the sh-7 (1978). 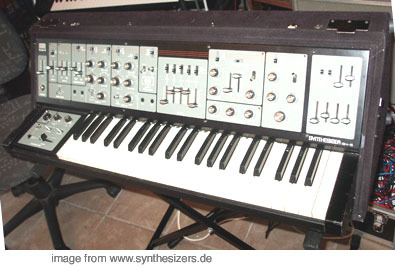 it was the latest model ,even after the system 100 which was the "most modular" one of the sh series (in fact the system 100 is a member of the sh-series family dynasty ;). 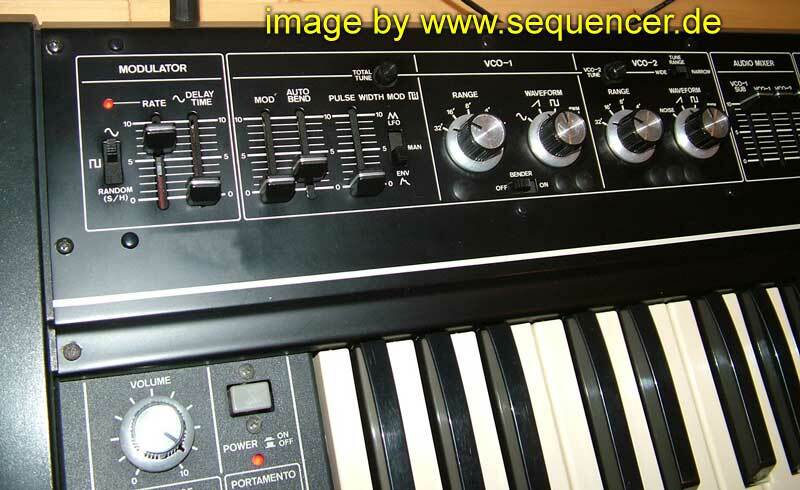 back to the sh7: it's VCO1 has 5 Slides to control 32',16',8',4' and 2' Square Waves (quite sh-3a like..) , hardsync with autobend, sort of a mini envelope with time adjustment ("decay"). 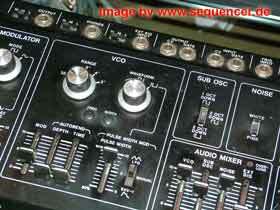 each VCO can be modulated by s/h, autobend or the LFO. yes! 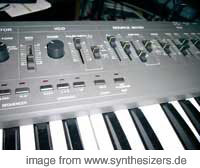 it's one LFO (20hz max still as the sh5, but the sh5 has 2 of them) the sample and hold is cool, like the whole sh series and sys100 it has some waves and random input, sample time and lag! so it is what s/h should be! complete! 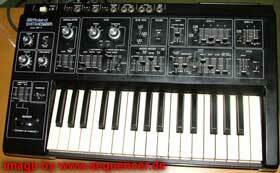 comparable to that of the arp2600..
the LFO sine wave can be fade in and the lfo can be triggered by Keyboard. 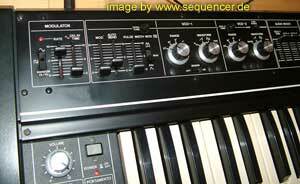 only vco2 has a fine tune as an offset to vco1. 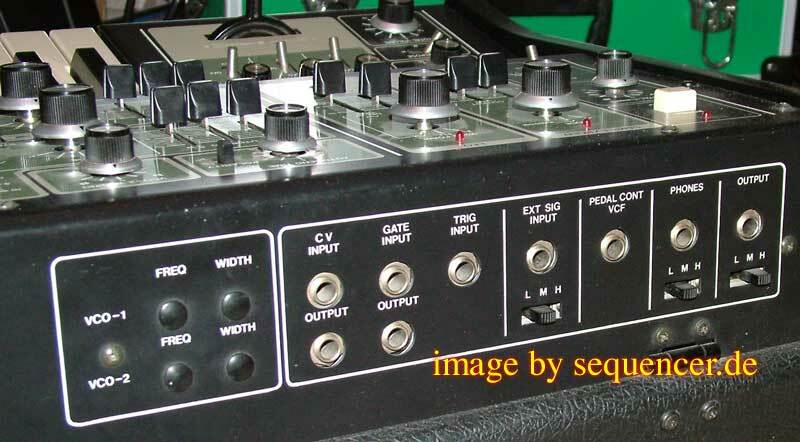 of course both VCOs have still their octave switch. there is an envelope follower and like most sh and later rolands there is a static hpf (non vc controllable). and a ringmod. 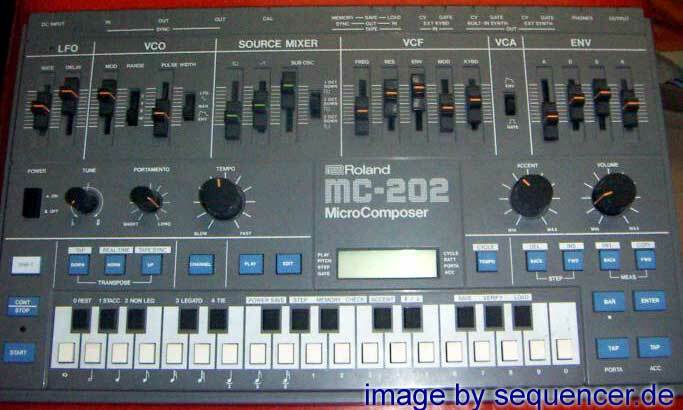 it allows vco1 and vco2 to be ringmodded or vco1 with ext. signal. 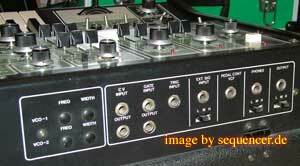 there's a noise generator with white and pink noise available ,too..
VCa can be modded by one of the envs..